Forget carbon fiber. The next bike that you ride on may be made of cardboard. 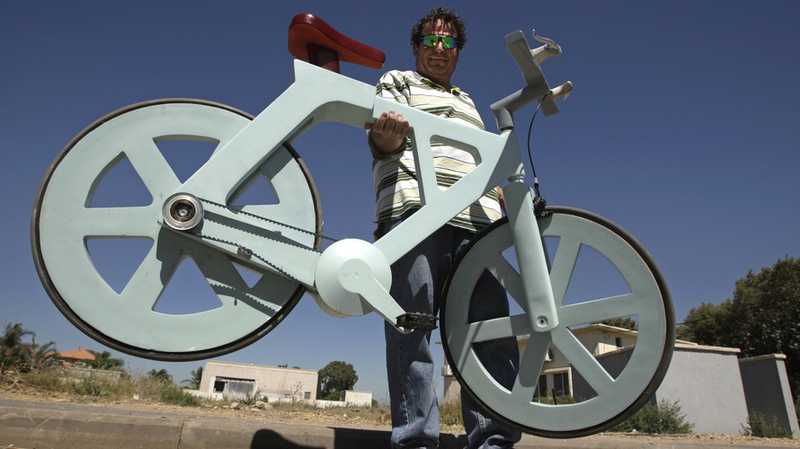 An Israeli inventor, Izhar Gafni, is moving closer to mass producing his cardboard bicycle. 18 months of development has led Izhar to discovering a ground breaking bicycle design. Once in the market, it will sell for close to $20 and weigh close to 20 pounds. 65% lighter than most metal bikes. The tires are made of reconstituted rubber and the ‘chain’ is a car timing belt. All in all, this makes for a truly ground breaking design and something that I am interested in looking at more closely once it comes to market. Check out the video of Izhar constructing the bicycle below. UPDATE: More pictures of the bike and a link to Izhar Gafni’s Cardboard Technology website. Mr. Gafni preparing a wheel.